This review is going to be a serious test in treading lightly, because it is possibly the most spoileriffic show in existence in recent years. One could argue that its mere existence is a spoiler for the previously-reviewed “Life on Mars.” Nonetheless, not only do I believe it’s possible, I believe it’s a bit important. To start, though, the only way to review it without spoiling “Mars” is to skip the setup entirely. Thus, midway through the first episode after some post-“Mars” setup, we are presented with Alex Drake (Keeley Hawes, recently of “Identity”), a police psychologist from the year 2008 who has been shot in the head and awakes in the year 1981, eight years after the events of the previous series. Unlike her predecessor Sam Tyler, though, Alex figures she’s got a handle on things — as she has received something of a forewarning about the characters Sam encountered during his time in Manchester of the 1970s. Thus she coasts a bit more self-assuredly through her first season, analyzing the psychological constructs around her as she, too, fights to get home. But she arguably has a little more at stake than Sam did: it’s her daughter Molly’s birthday, and all she wants is to get back to 2008 so she can help her little girl blow out her candles. At first glance, there are dozens of similarities between “Mars” and “Ashes”: our protagonist is lost in another time and/or place, expected to assimilate themselves into it as they fight instead to leave. They’re confronted with scraps of their own pasts, and are haunted by creepy period entities (where Sam was stalked by the late-night test pattern girl off the TV, Alex finds herself being followed by a doppelganger of David Bowie in clown gear from the video for — that’s right — the song “Ashes to Ashes”). From there, though, it goes left … then makes a handbrake turn, goes left again, and ends up in another city entirely. For a start, look up at the cast. I’ve listed it, as I always do, in original billing order. Where John Simm took top billing in “Mars,” Philip Glenister as Gene Hunt is now in the #1 spot. 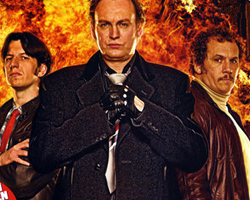 The events and narrative are spread out much more evenly among the cast, including Dean Andrews and Marshall Lancaster reprising their roles as Ray Carling and Chris Skelton. But it’s definitely become Gene’s show. Alex does get her fair share of time, and we’re still following her as the “audience association” character, but either the writers knew what the fans wanted, or they knew where their own story had to go. Possibly both, especially as he continues to hold the title for owner of the majority of the best lines in every script. Three other major different points: One, “Ashes” is far darker. “How! ?” I hear “Mars” viewers cry. While the directing never resorts to jump-and-scare, the imagery is far more unabashedly gory and disturbing, especially by the beginning of third season where the show goes into full Mindscrew Mode. (Those of weak hearts and stomachs, now is the time to step away.) There is also, at least so far as I have witnessed, a much stronger attack on the psyches of any parents or parents-to-be in the audience. The Molly thread in Alex’s story has floored more married couples than I can count, leaving singleton viewers not untouched, but a little bewildered. Two, unresolved sexual tension out the expletive. Alex is, while not a replacement for Sam, a fair follower: she brings yet more new insights into Gene’s realm of experience, challenging him at every turn. But even though she comes across as (initially) far more selfish and self-obsessed than Sam was, she softens up eventually as she — unlike Sam — takes more stock of her surroundings. To that extent, she and Gene connect on a level that will drive dedicated viewers up the damn wall. Fortunately, any toes dipped in the murky waters of of Lake Will-They-or-Won’t-They are quickly withdrawn before they overshadow the plot (and metaplot). And finally, this one is careening straight for a definite ending. “Life on Mars” … was not. Here, you can tell from Day 1 that they’ve got an end point in mind, and they intend to let you have a look at it. While some viewers don’t necessarily find the ending satisfactory in every little detail, it does tie things up. In other words, you will know what’s going on. More than can be said for a lot of mindscrew shows on the market. One thing I lamented in my “Mars” review was lack of character growth for anyone besides Sam and Gene. Here, fortunately, Ray and Chris (and new girl Shaz Granger, played adorably by Montserrat Lombard) get their share of attention as we get to see them as more than just their one-word stereotypes. And fortunately for us all, Alex — who starts out her run as know-all and borderline unsympathetic — does a fair share of growing up by the beginning of second season, too, and actually becomes likable. By way of quality, it’s very hard to pit “Mars” and “Ashes” against each other … and a bit unfair. By the end, they are one and the same show. Visually, “Ashes” is much brighter, much more Eighties (well, quite), with a great deal more stark black-and-white coloring. (The core team veers towards dark colors wardrobe-wise, and Gene himself has been re-clad in all black and a rather swoopy coat that drives home a much eerier, otherwordly image of him than previously presented.) The characters we remember have changed, but more in the sense of growth than overhaul. Where “Mars” was fueled by atmosphere, “Ashes” is driven by purpose. Can you move forward between the two? I venture a yes, provided you are patient and can handle having your head played with. “Ashes to Ashes” has just finished the second season of its three-series run on BBC America, and has wrapped in the UK — with season box sets coming soon. The fact that this writer was born in the year the show took place is both an interesting coincidence and utterly shaming.